Jasmine is a lovely flower and has been used for centuries to add its wonderful floral fragrance to teas. This is a Chinese green tea scented with jasmine. There are seven grades of quality, depending on the type of tea used and the care used in the scenting process. (Read more about this type of flavored tea here on our blog.) In this case, this a downy silver tipped green tea and most of the jasmine blossoms have been removed. The result is a balanced and delicate flavor of tea and bloom that will add a touch of romance to your day and is also pleasant to sip and relax with in the evening. As one of our customers commented, a dash of agave nectar will sweeten and heighten the jasmine presence in your cup. Black and green tea take on the glorious Spring-time scents of jasmine blossoms and cornflower petals while also combining with natural flavors such as oil of bergamot. The combination results in a tea perfect for that afternoon tea break to catch some rays after being cooped up inside during the cold months of Winter. The teas used are a high-grown Ceylon black tea flavored with oil of bergamot, green tea from the Fujian Province of China scented with jasmine, some malty Borengajuli Estate Assam black tea, Dimbula Ceylon tea, and some Kenyan from Kambaa and Kagwe. They play together like the London Philharmonic Orchestra where everything is in tune and harmonious yet distinct. A couple of our customers have commented that this tea really lifts their mood and goes well with sweet foods! Just remember as you’re sipping that this tea has been a long-time favorite at the annual garden tea part held in May by the Queen at Buckingham Palace. See more about the annual Buckingham Palace Garden Party here on our blog. Just remember that April showers bring those flowers that into fruits do grow – and mixed with white tea they do bring glee with each sip setting heart aglow! Hee! A bit of tea time poetry here. Seriously, this is a wonderful white tea with natural flavors of peach and apricot – two stone fruits whose flavors often are imitated in some of the finer teas but here are added in, almost like a fruit-ade but with that white tea goodness. One customer remarked on the divine aroma of this tea and another said she combines it with our blueberry green tea for an even fruitier taste. Whatever way you steep it, this tea will be an uplifting experience. Be forewarned that this tea is not a straight oolong but a blend of Ceylon black, Taiwanese oolong, and green teas. If you are used to steeping your oolongs a certain way, such as in a Yixing teapot or gaiwan, it will not necessarily be a good idea here. In fact, I prefer one of my smaller ceramic teapots (the reason that I have a bevy of teapots instead of just one or two – in fact, I’ve added to that bevy since writing this article awhile back). One of our customers commented on this and her own experiments with steeping it various ways. In addition, while the name says “orange blossom,” there are actually jasmine petals and other natural flavors, including dried orange pieces, in this tea. Another customer blends it with blueberry tea for serving iced. Several generations of Harneys have built a tea company with a solid reputation, and this tea is one that does them proud. A classy black tea is infused with lemony oil of Bergamot to just the right level. You will find it perfect for your afternoon tea moment or even for that quiet night-time tea time when the house is still and everyone else is in bed. One customer remarked that this tea was rich in flavor, smooth, and not bitter. Sounds like a winner to me. 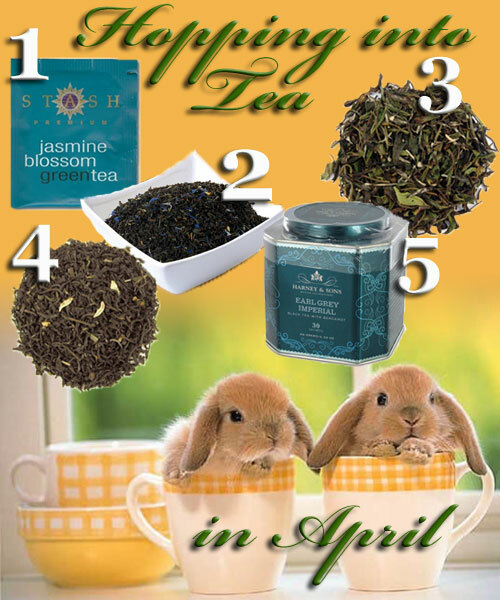 Hope you get to try some of these during April to help you get make that transition into Spring a smooth one. Enjoy!